Updated Saturday September 19, 2015 by Stanley Park Optimist Club. Photo: Ed Fleischer is shown with the 20" smallmouth bass that earned him first place - and $2,000 - at the 2014 Grand River Bass Derby. It was another very successful year for the Derby - the 27th annual event - with 480 official entries plus a lot of youth - all of whom received a prize package. Organizers are already getting things in order for next year's derby! At 3 p.m. on Sunday, July 6 the 2014 Grand River Derby officially closed and the results became final. Congratulations to all the winners, those who managed to catch a fish (or more) - and those who participated in this year's derby. Peter Holden earned $1,000 by catching one of them. The other is still worth $100 when the tag is brought in (within a year) to Nelson at Natural Sports. Ian McDougall got to ride it out of the room – and keep it! We hope you enjoyed the great weather this year, had at least a few nibbles - and made it out to the award presentations and door prizes at the closing ceremony. 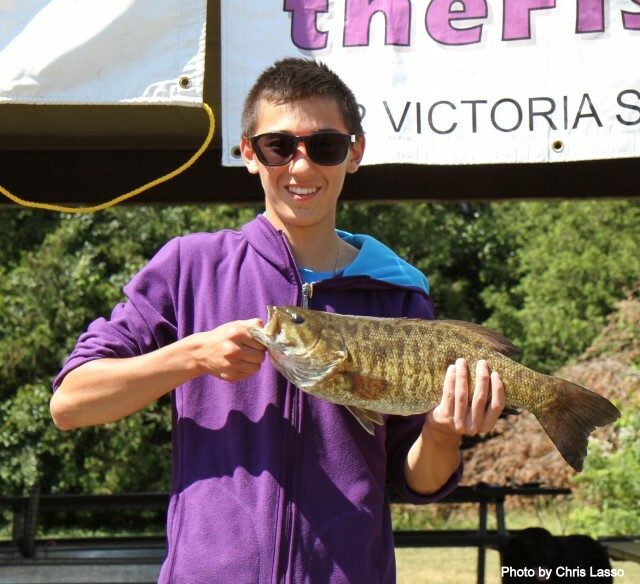 Come out and join us in 2015 - the fish will all be bigger! Dates and details to be confirmed.